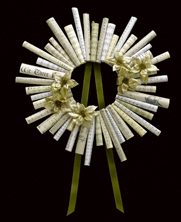 This is a delightful wreath for the music lover, one that is banded with sheet music rather than foliage! Make in three easy steps. Round-Face Wreath, 12" x 2-1/2" x 1"
Coordinating ribbon, 1" x 1-1/3 yds. Use paper trimmer or scissors to cut each sheet music page in half. Roll all half-page sheets into tubes from 1/2"-1" diameter; apply thin bead of white glue along length of tube to secure paper edge. Note: To ensure uniform sizes and save time, wrap papers around dowels. Cut tubes into a variety of lengths from 3-1/2"-7". Use glue gun to secure tubes to foam wreath. Keep tube ends around wreath opening even to create smooth circle; refer to photo. Fold ribbon in half to create a long, thin V shape. Glue V shape to back of wreath to create hanger. Glue florals to wreath as desired. As a musician, artist, writer and journalist, this is a wonderful idea I will try. The possibilities include using journal pages copied of original handwriting, or even newspaper pages copied and rolled up in the same manner. You could use any color flowers or attachments for accents. Hang it on the front or back door for a personalized greeting. Very cool idea, one I'll share with friends.